When considering the EU question, I asked myself what is the sustainable option for our environment? 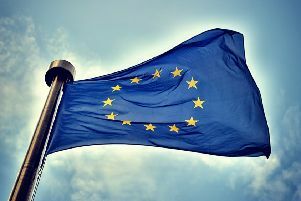 Many green groups point to EU green legislation as reason to stay in. Yet the EU’s commitment to free movement of people renders our government powerless to control the biggest threat to our natural world: human population growth. Sir David Attenborough said ‘our environmental problems become harder and ultimately impossible to solve with ever more people’. Sustainability relies on us doing two things: consume resources more responsibly and stabilise the number of consumers. One without the other is pointless. Currently we are compounding our society’s deeply unsustainable behaviour by increasing in number. Imagine in the unlikely event that we all recycled more, drove less, went vegan, bought less stuff, etc. A growing population would still require us to build over the green belt, destroy more habitats, import more food and burn more fossil fuels. Our ecological footprint would be the same if not worse. Between 2004 and 2014 the UK’s average annual natural growth (the difference between births and deaths) was 210,000 whereas average net migration was 243,000. Last year, net migration was 333,000. Bear in mind that 26 per cent of births since 2001 were to foreign born mothers meaning that migration has boosted our natural growth too. Roughly half of net migration is from the EU. Considering that the EU’s population is half a billion whereas the rest of humanity numbers about 7 billion, this proportion should be much smaller. Those who argue that we need migration to support our ageing society seem to have forgotten that migrants get old too. Indeed this approach would mean that every passing generation would require more migrants than the last to balance the dependency ratio. Migration is not a long term solution to the problems of an ageing society. Projections suggest that the UK will number 78 million by 2037 and 132 million within a century. I suspect that long before these figures are reached, conditions will become so awful that people will stop coming or border controls will be tightened. Currently the EU is denying us the freedom to do this. If we leave the EU, UK governments will be free to apply a fair system to all based on merit instead of applying the EU’s racist system which discriminates against those born outside of the EU. More importantly they would be better placed to stabilise population growth and safeguard our environment for all the people, plants and animals which live here.